This is a short post in response to a question by a reader who wanted to clarify what the scale systems and their names mean in Chinese music. Scales are the set of musical notes arranged according to pitch. There are many different types of scales, of different number of notes and pitches from music all around the world. Chinese music has a very wide variety of different types of scales. Music from some parts of China uses as little as 3 different notes while in other parts of China, there are music that utilises a scale of even up to nine notes. However, most traditional Chinese music uses a scale from between a range of five to seven notes. The ancient Chinese did not name the notes in the same way musicians from the West did. Hence degrees of the scale were not named tonic, supertonic, mediant, sub-dominant, dominant, sub-mediant, leading note and so on. Nor did they have the names of the solfege - do, re, mi, fa, so, la, and ti. Even though Chinese musicians nowadays use solfege, this came about only in the very recent past. Before the introduction of the solfege system into China, musicians had different names for the degrees of the scale. The basic scale used in most traditional Chinese music was the pentatonic scale. Hence, degrees of the scale were named using five basic names: 宫 (gong), 商 (shang), 角 (jue), 徴 (zhi), 羽 (yu). These five words represented the 5 notes in the pentatonic scale, do, re, mi, so and la. These 5 notes can be used to form a number of different modes found in Chinese music. The modes are so named, based on the note which is the most important in the piece of music. Notes can be high in importance based on some principals such as the frequency of its appearance in the piece of music, the length of the note, the accents on the note, or the position of its occurance - important notes usually appear at the beginning or ending of phrases. A piece of music is said to be in the gong mode if the note do is of the highest importance. The scale used in this piece of music would then be do, re, mi, so, la or 宫 (gong), 商 (shang), 角 (jue), 徴 (zhi), 羽 (yu). If this mode is based on the key of C (C 之宫), the notes would be C, D, E, G, A. If this mode is based on the key of D (D 之宫), the notes would be D, E, F#, A, B. Similarly, a piece of music in the shang mode would have the note re as the most important and the scale would be re, mi, so, la, do or 商 (shang), 角 (jue), 徴 (zhi), 羽 (yu), 宫 (gong). If this mode is based on the key of C, the notes would be D, E, G, A, C and if this mode is based on the key of D, the notes would then be E, F#, A, B, D.
The scales for the other modes work on the same principal. 宫 (gong), 商 (shang), 角 (jue), 徴 (zhi), 羽 (yu) refers to the degrees of the scale and not to the absolute pitches and so 宫 (gong) can refer to the note C in the key of C, the note D in the key of D and so on. 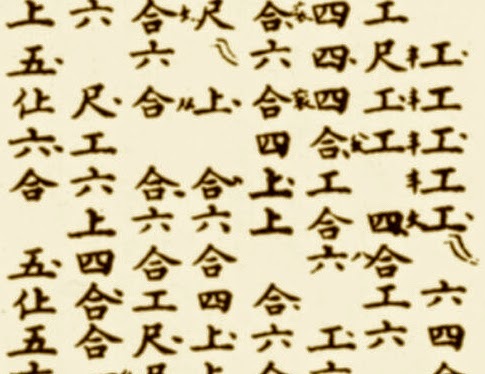 Note the difference here between these words representing the notes in cipher notation as compared to the words 宫商角徴羽 which are used to represent the degrees of the scale. Perhaps an analogy would be these 宫商角徴羽 are a parallel to the names we use in Western music for the degrees of the scale, tonic, supertonic, mediant, and so on; and not as the names of the notes such as C, D, E etc. Thank you so much for all the great information on here! I am having a problem reading specific parts of your posts, when you specify certain notes.. i.e. "a commonly used type of cipher notation uses the words 合，四，一，上，尺，工，凡，六，五，乙 to represent the notes zgzhzjasdfghj"
What does "zgzhzjasdfghj" mean? Is it something that my browser is just not reading correctly? (I'm using Chrome and Safari on Mac) I keep seeing these similar strings of letters on all your posts regarding pitches. I'm so sorry, I realised the fonts I used for the numerical notation do not turn out correctly in some computers. I'll rectify the problem as soon as possible! What would the notes be if it is G gong, re based? Thank u! I'm sorry, I do not understand what you mean by re based. If it is G gong, it means that the note G is gong, and hence the notes of this scale will be G,A,B,D,E if it is a pentatonic scale.